I felt there are skills that I had never had much time to learn or practice as an undergraduate student that are really important when working in a physics research lab. As I become a teaching assistant I saw the same, missed opportunity for students to learn these skills; they’re not something you can just learn from a textbook. My idea was to provide a kit you could borrow and take home. How did you prepare for submission of the project? 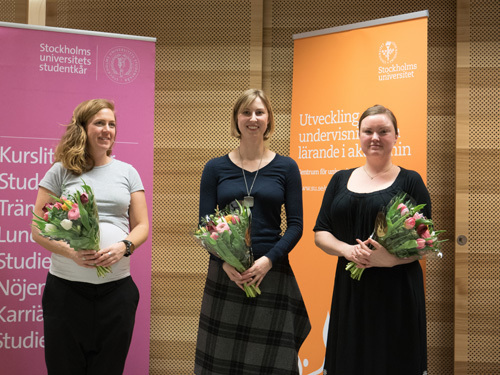 I attended an information session run by the Centre for the Advancement of University Teaching (CeUL) and the Stockholm University Student Union (SUS) in which interested applicants could discuss and develop their ideas. Lecturer Chad Finlay was supportive of the concept and agreed to be the department contact. Then I just wrote out my idea for submission. The project is to develop take-home experimental skills kits that allow students to learn, within their own space and time, essential experimental skills. Such skills require repeatability and practice, requiring time and access to equipment. Often these skills are not the focus of the lab exercise, so it can be hard to pick them up in labs alone. The kits are intended to provide undergraduate students with an opportunity to learn some simple lab skills such as soldering, electronics, optics and design. Each kit (the size of a shoe-box) will contain instructions and required equipment. The student will be able to take the box home on loan and spend as much time as they like practicing and learning. Each box will target a basic lab skill and will be available for loan to any interested undergraduate student.